Nowadays there are a lot of cookware set on the market available. One can’t simply know what is the best value for their money. So if you ever wondered about choosing a stainless steel or a copper cookware you are in luck. Keep on reading our head-to-head comparison of copper cookware vs stainless steel! Copper cookware has a lovely appearance. It has been up there with the favorites among gastronomic and culinary experts for years now. It is traditionally made with a tin interior, so it can prevent the food from reacting with the copper. 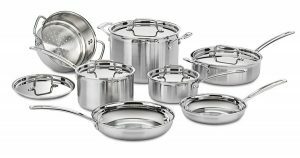 Modern cookware uses a line of stainless steel, for added durability and cleaning ease. It’s the biggest benefit is that it distributes heat evenly and that it warms up quickly. Providing better cooking control. Even though it satisfies all cooking needs, it has an advantage in cases and recipes where the management of the heat is essential. Like candy making. Expert chefs admire and prize copper cookware for their precision when it comes to maintain the perfect temperature. Thus making them ideal for sauces, braising and browning. Furthermore, copper is anti-microbial, which means that it resists bacteria. Just as having a reputation of being highly precise, it also has a reputation of being highly pricey and that it reacts to acid. This is the reason why they are lined. Because pure copper pots can leave a taste of metal to the food. It is also high in maintenance. It requires constant polishing to maintain its shine. You have to be gentle though, as it can easily dent. Furthermore, you should never use copper cookware on a ceramic glass top stove, because it will leave metal marks on the surface of the stove. If you have your heart set on copper, be prepared to invest, because copper is one of the most pricey types out there. Using stainless steel to cook for the first time can be a very fun adventure. Having no idea on how much oil to use, frying resulting with a fried pan and similar kitchen disasters. However stainless steel is everywhere you look around the kitchen. Whether it is appliances, mixing bowls, pans or utensils. Why is that so ? Let’s find out, starting with the benefits. Stainless steel, as an iron alloy, doesn’t tend to bend, crack or easily chip. Along with that, it will be shiny for long years. As long as you care for it right. Stainless steel is highly durable, it won’t react to wear and tear, it is also a non-reactive material. This is good because the food won’t pick up any flavors from the pans and pots. You won’t have to worry if you are making strong sauces, using your favorite acidic food or melting cheese. Another benefit is that this material is durable and dishwasher-safe, along with the fact that it is available in various prices. Keep in mind that more basic inexpensive models are prone to hot spots. On the other hand, pricier options, like the ones with added inner aluminum or copper improve the heat conductivity and will last for a lifetime. The biggest flaw of the stainless steel cookware is it’s heat conductivity. Namely it can’t evenly heat up, thus resulting in hot spots, causing foot to cook unevenly, or worse, burn. Another flaw is that recipes for stainless steel cookware require a bit more grease. You’ll see the bad side of this when it’s time to clean up. Food can get stuck and it will require some strong scrubbing to maintain its shine. Steel wool and soap usually do the trick. One last thing, stainless steel is rust prone if exposed to moisture. So if you live in a humid climate you should look for a different cookware.